What happens when the incredibly talented artists decide to depict Hindu Gods from a different perspective? See for yourself with these recreations of Hindu gods by various artists. You can also add your art to this list and inspire people! Also known as Subrahmanya, Kadhirvelan, Kandhan and Skanda, was born to Agni and Swaha according to Vana Parva of Mahabharata. In other texts such as the Shiva Maha Purana and Kumarasambhavam, Lord Karthikeya was born to Lord Shiva and Goddess Parvati. Surya is depicted as a red man with three eyes and four arms, riding in a chariot drawn by seven mares. Surya holds water lilies with two of his hands. Nandi signifies strength, load bearing capacity and virility. Given that Shiva didn't have to fight fierce battles or travel quickly between the worlds (he spent most time meditating) he didn't have to choose for a more agile Vahana (Ride) similar to Vishnu's. Given that bulls were the main form of transportation in rural India, it made perfect sense for Shiva - who is the most down to earth & connected with rural India - to take a form that was close to the people. Balarama is regarded as an incarnation of Shesha Naaga. He may have originated in Vedic times as a deity of agriculture and fertility. 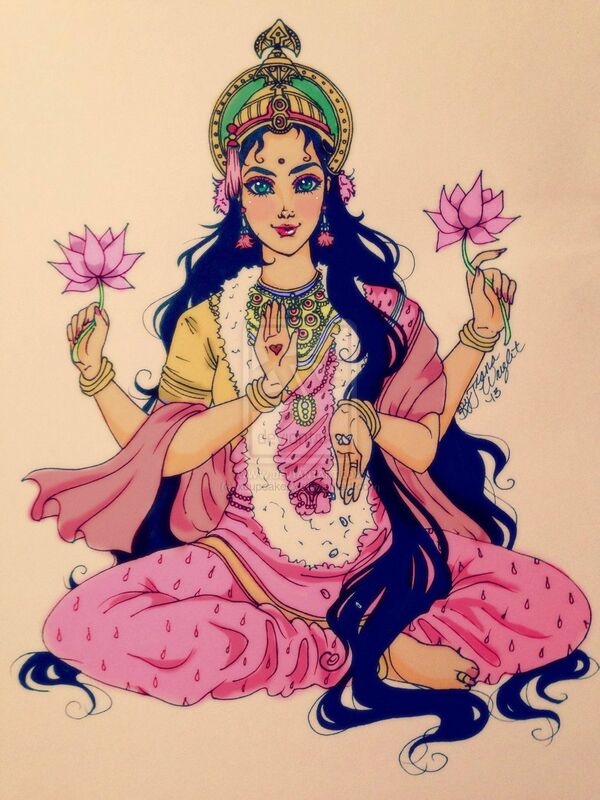 Lakshmi is the goddess of wealth, fortune, power, luxury, beauty, fertility, and auspiciousness. She holds the promise of happiness, material fulfillment, and contentment. She is the wife of Lord Vishnu who is the Supreme God in Vaishnavism. She is described as restless, whimsical yet maternal, with her arms raised to bless and to grant. For centuries Hindus have invoked her and sought her blessing. Goddess Lakshmi’s four hands represent four goals of human life considered important to the Hindu way of living – Dharma, Kama, Artha and Moksha. Lord Ganesha dwells in every human being in the form of intellect and wisdom.Lord Ganesha is also referred to as Ganapathi in the Rig Veda. ‘Gana’ means multitude in Sanskrit and here it refers to hosts of Brihaspathi and ‘Isha’ means Lord. When these two words are coined together it becomes Ganesha or Ganapathi – both refers to the Chief of Ganas. The word ‘Ganas’ symbolize desires, thoughts and impulses. Lord Ganesha is identified with divinity in its perceptible manifestation. The human part of Lord Ganesha which represents the manifest principle, is subordinate to the unmanifest depicted as elephant. When Divinity is depicted by way of symbols, opposites can co-exist. It is this combination of co-existence of the human-part and the elephant (manifest and unmanifest) led to the formation of PRANAVA. Elephant is a wise animal and hence elephant-head symbolizes wisdom. Elephant is also a symbol when existence begins as well as the issuance of the syllable AUM. It is from AUM, the Veda was issued as Universal Law. From the Veda the Universe was created. PRANA is the life-force and VA is the energy of Lord Shiva, known as Shiva-Sakthi. When they mingle in the vibration of PRANAVA, Lord Ganesha reveals himself. Lord of the hosts, sit down among us, they call thee the greatest sage among sages; without thee nothing is done in the distance; great, wondrous, Maghavan, is the hymn I sing thee. And broken down the forts, the Fort-destroyer, a Friend with friends, a Sage among the sages. Indra increased in might in display of valour; He the lord of all, the imperishable, bestows felicity to his worshipers. Indra surpasses both the worlds, a mere portion of him is equal to both heaven and earth. The protector of sacred rites, the progeny of sacrifice, bestows prosperity on him who offers to Indra praises and prayers with sacrifice. You are more precious Indra, than my own father, or than my unaffectionate brother; you oh giver of dwellings are equal to my mother, for you both bless me with prosperity. Verily, in the beginning there was here the non-existent . As to this they say, 'What was that non-existent?' The Rishis, assuredly,it is they that were the non-existent . As to this they say, 'Who were those Rishis?' The Rishis, doubtless, were the vital airs: inasmuch as before (the existence of) this universe, they, desiring it, wore themselves out (rish) with toil and austerity, therefore (they are called) Rishis. This same vital air in the midst doubtless is Indra. He, by his power (indriya), kindled those vital airs from the midst; and inasmuch as he kindled (indh), he is the kindler (indha): the kindler indeed, him they call 'Indra' mystically , for the gods love the mystic. They (the vital airs), being kindled, created seven separate persons (purusha). Goddess Durga is the powerhouse of purity and the destroyer of evil. Gandharva Astra is mentioned in Valmiki's Ramayana first chapter Bala Kand sarga 27, Shri Rama used the Gandharva Astra to kill and destroys the army of about 10,000 chariots,18,000 elephants, 14000 horses with their riders, and 200,000 ground soldiers with superhuman speed in a matter of three hours.